This blog doubles as a home for news on both my musical activity and my thoughts on the day job of eLearning. 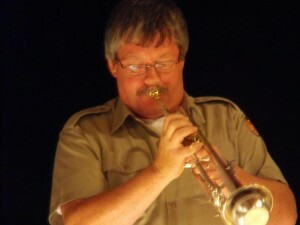 My work as a Trumpet player encompasses many different genres from the Big Band sound of the 40’s, working with function/covers bands, through to Orchestral work. In addition to trumpet, I am available on Flugel, Soprano Cornet, Piccolo/Eb/D Trumpet and also have a set of Fanfare Trumpets – ideal for weddings or ceremonial events! Credits include: 2 appearances on “The Wogan Show” BBC) with the Paul Turner Big Band in the mid 80’s, conducting “Uckfield Concert Brass” live on The National Lottery Live (BBC) and performing in backing orchestra’s/bands for Katherine Jenkins (with The Sussex Symphony Orchestra), Kenny Baker & Don Lusher to mention just a few. Andy was awarded the 2003 COROUS Annual Award by the Open University in recognition of his work in the world of elearning. he also holds an MBA from the OU. His work at Legal and General has also earned 2 awards in 2009 – a bronze award for the ealearning team at the 2009 eLearning Awards in the category of “Excellence in the creation of eLearning” plus a Silver Award at the 2009 CLO “Learning in Practice” awards in the USA for the use of Collaboration tools. In January 2012, Andy joined the UK’s leading eLearning Company, Kineo, as a Senior Learning Technology Consultant leading on their TotaraLMS. However, a call from Nick Howe at Hitachi Data Systems took Andy back to the client world as Academy Technology Manager in July 2012. Andy is an employee of Hitachi Data Systems but all views expressed are his own and do not necessarily reflect the views of his employers.